Not long ago, I wrote about how I am not very interested in hockey and despite that fact shared some thoughts. Well, I’m going to share some more thoughts about the sport. If you remember, I shared my thoughts about George Stroumboulopoulos and the suit that truly didn’t fit. The truth is, it fit on him – just not his boss, his boss’s boss, and the very big boss. The very new and very big boss at Rogers decided that HNIC needed a new direction, new energy. Change it up a bit – no, not a bit – a lot. Sometimes you can throw the baby out with the bathwater. That experiment didn’t seem to work out so well. We’ve all seen or been a part of situations where we are doing a great job and new leadership comes in. In many cases it is a good decision to move in new leaders and key people. This is not one of those cases. 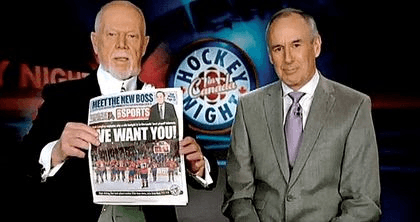 Many careers have stalled, and staff have been fired over the decision around Ron MacLean and the show direction in general. In the business of hockey, Ron brings a sense of class to the game. From 1986-2014, almost thirty years, he was the key host for HNIC. He was classy, intelligent, patient, wise. I could relate to him more than lets say, Don Cherry, who I also admire but for very different reasons. The thing that really impressed me (and more importantly, the Very Big Boss) was the respect and humility Ron showed within a context that I am sure he was not at all happy with. In his new role, he dug in, did a great job, and was class act. In fact, it was noted by the entire leadership team and his peers how professional he carried himself in a situation that everyone knew wasn’t working. They say our character is truly shown in circumstances that are difficult. Ron’s character showed the proof is in the pudding. We all knew he was not just great at what he does, he was a true decent human being to boot. See, the suit fit Ron best after all. We knew it, Ron knew it, and the Very Big Boss rediscovered the truth in that. My team and I can help you onboard new leaders in a way that will create a positive impact on your existing organization’s structure, products & services. Don’t throw the baby out with the bathwater – we can help ensure a seamless transition. We help individuals and organizations every year in all sectors and industries make the best career and leadership decisions. Who is your career & leadership coach?